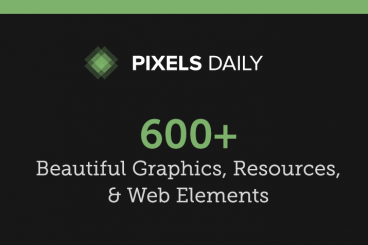 We’ve recently been making some changes over at PixelsDaily, our sister-site containing hundreds of high quality web elements, graphics, icons, and resources for designers. PixelsDaily now has an all-new responsive design, simpler ways to browse and search the library, straight-forward pricing, and a selection of fantastic new resources (that we’re adding to every week)! Read on to find out more, and get a 25% discount as a Design Shack reader. We’ve tweaked and improved our design to make the site easier and more enjoyable to browse around, as well as being completely responsive. It’s built on top of the Pure CSS foundation, which met our needs perfectly, and we’re using Stripe to handle all our membership payments (which is great). For a long time, PixelsDaily has felt like a blog. We’ve changed that with this design, to make it clear exactly how much value you’re able to get for your yearly membership. While a few of the resources on the site are completely free (there’s a nice selection on the homepage! ), it costs $24 per year to access everything. We’ve added hundreds of delightful new resources over the past year — everything from icon sets and patterns, to web elements and vectors. The collection has grown to over six hundred resources! This week only, if you use the code delightful pixels when joining PixelsDaily, you’ll save 25% forever ($18 per year, rather than the usual $24)! Over six hundred resources, for the equivalent of $1.50 / month. It’s a pretty great deal! We’d love to welcome you as a member, and share a few of our lovely resources with you!